For a modern update to your space, this Luxury complete bed and sheet set will provide a whole new look of your bedroom. 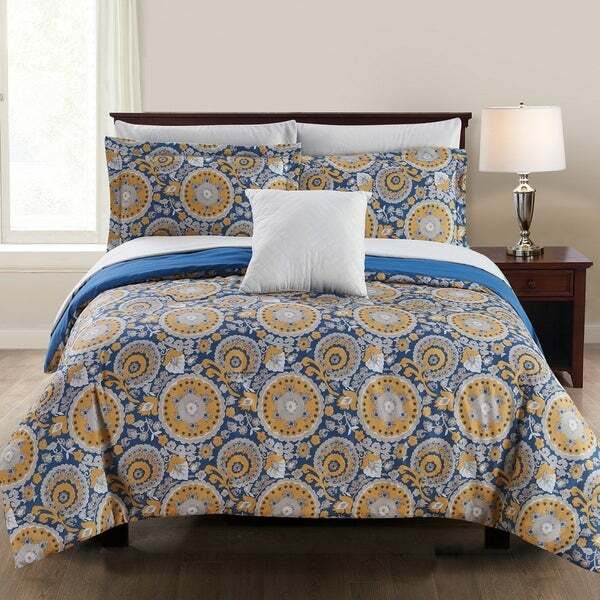 Made of microfiber, the comforter and sheet set is machine washable for easy care. Set includes 1 comforter, 2 shams, 1 flat sheet, 1 fitted sheet, 2 pillowcases, 1 deco pillow (Twin has 1 sham and 1 pillowcase). This bedding set looked so comfortable and beautiful online. It came in at the correct time. It had all the pieces and was the correct bedding set. The first night sleep with my new bedding was great. The sheets were very soft and comforter was very light and fluffy. The only problem with is the stuffing inside the comforter. It bunches up in different spots, and doesn't stay even throughout the comforter. While the pattern is nice, the quality of the comforter is sub-standard. It has not been washed and already the stuffing is shifting. Plus the size is small. We have a king sized bed and bought the king size set. The comforter had no overhang, it only fit the top of the bed. Disappointing overall. I liked Amrapur so much for my room that I bought this set for my other bedroom! It's so soft with a little sheen to it. Luxurious! The comforter isn't as nice as I thought it would be. the stuffing inside bunches up and I don't see it lasting very long. Didn't like this at all ! The inside filler is not tacked to the top and bottom ; It moves around and bunches up .Leaves thin spots all over. It's hard to pay good money for something this poorly made. Looks like something you would find at a cheap motel. We washed it and shredded already. Isn't worth the *** to return (paid less than ***). Going to sew it up and use it on the pull out couch. "Why did you rate only 2 stars? Quality, feel, looks, size?? Was wanting to purchase but scared to based on rating."